Would you like to receive a physical gift card in the mail? If you wish to receive a physical card, check the box above and the card will be sent to the shipping address you provide. If you do not elect to receive a physical gift certificate (gift card), you will be sent an electronic certificate via email containing details about your gift certificate. Gift cards are redeemable in the Shipping & Payment information page in the shopping cart. 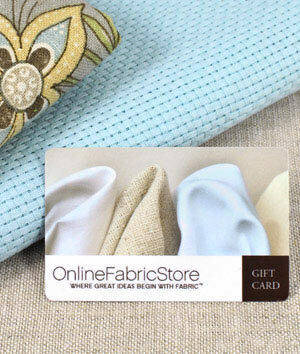 OnlineFabricStore sells both email (electronic delivery) gift cards and physical cards. There are no additional fees and no shipping fees for ordering a physical card. When ordering a physical card you will receive an email with your Gift Card Code and Gift Card Balance, as well as a physical gift card in the mail. Gift Cards ship USPS and may take up to 7 days to receive. The Gift Card Code can be found on the back of the physical card. If you do not wish to receive a physical card (leaving the check box unchecked) you will only receive an email concerning your gift card information. Please be sure to add help@onlinefabricstore.net to your safe sender list in your email to ensure that you receive the gift card email. If you have ordered a gift card and not received an email with details about your card, please contact customer service. Your gift card information will be sent in a separate email from your order confirmation email. To view your current gift card balance, log on to your account. Once logged in to your account, click on "View Gift Cards" to view your current gift card balance and code. The "View Gift Cards" link will only be available if you have purchased a gift card. If you have purchased a gift card and are unable to view your current gift card information on your account page, please contact customer service. Gift cards cannot be redeemed for cash unless required by law. Gift cards do not expire, however if you received a gift card as part of a specific promotion (as opposed to purchasing it), there may be an expiration date, which you will find located on your gift card email notification. The amount of the gift card will be subtracted from your order grand total (including shipping). If the gift card amount exceeds your order total, your gift card will be credited the remaining balance and can be used for another purchase. To apply a gift card to your order, add your desired items to the shopping cart and proceed to checkout. On the Shipping Information page, enter your gift code in the Gift Card Number field. The gift code can be found in your gift card email or on the back side of the physical card. By clicking apply, the amount of your gift card will be applied to the current order. It will also display your current gift card balance. To remove a gift card from your current order, simply click the "Remove" button next to the Gift Card Number field. If your gift card number is invalid or the current balance is $0.00, no additional discounts will be applied to your current order.